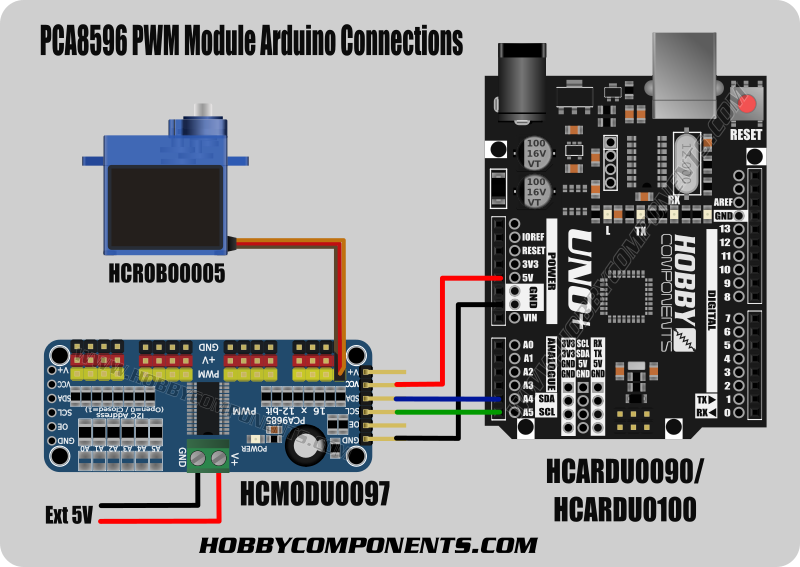 This module (HCMODU0097) is a breakout board for the NXP PCA9685 16 channel PWM controller. It features 16 fully programmable PWM outputs with a 12bit resolution giving a total of 4096 programmable steps with a duty cycle being adjustable from 0% to 100%. Additionally, the output frequency of all 16 channels can be programmed from 24Hz to 1526Hz. Intended for controlling the brightness of multiple LEDs, the programmability of its PWM outputs means that it can also be configured for producing PWM signals compatible with driving standard servos. In fact, this module has been designed with this purpose in mind with 16 sets of headers that allow for any servo with a standard header to be directly plugged into the module. A screw terminal block provides a means of powering the attached servos from an external 5V PSU and so the number of servos you can drive from your microcontroller and so is not limited by the microcontrollers own power supply. For Arduino users, with this module and our exclusive Arduino library (HCPCA9685) you can directly control up to 16 servos from your Arduino with only a few commands. The module also includes an I2C header with 10K pullup resistors and so only requires two data pins (SDA & SCL) to control the module. Solderable pads on the module provide a means of changing the default I2C address (0x40) to one of 62 options, meaning more than one module can be connected to the same I2C bus. A wide operating range of 2.3V to 5.5V allows the module to be powered from a range of power supplies and when powered from a 3.3V supply is safe to interface to a Raspberry Pi or 3.3V or any other non 5V tolerant microcontrollers. PLEASE NOTE: The PWM output pins on this module are capable of sinking a maximum of 25mA or sourcing a maximum of 10mA. Do not attempt to drive high current devices such as motors, bulbs etc, directly from these pins as you will risk damaging the module. 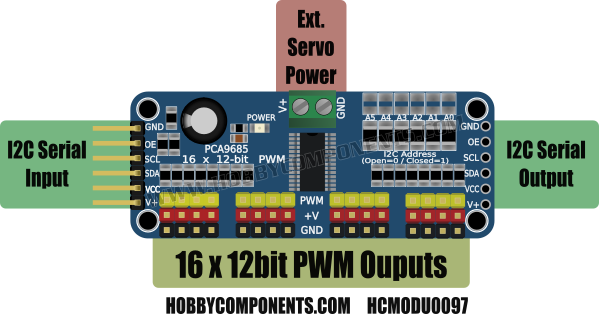 For servos, power is provided externally via the terminal header and only a small amount of current is drawn by the servo from each PWM pin. For Raspberry Pi uses we have tested this module with the free Cayenne cloud based IoT software platform. 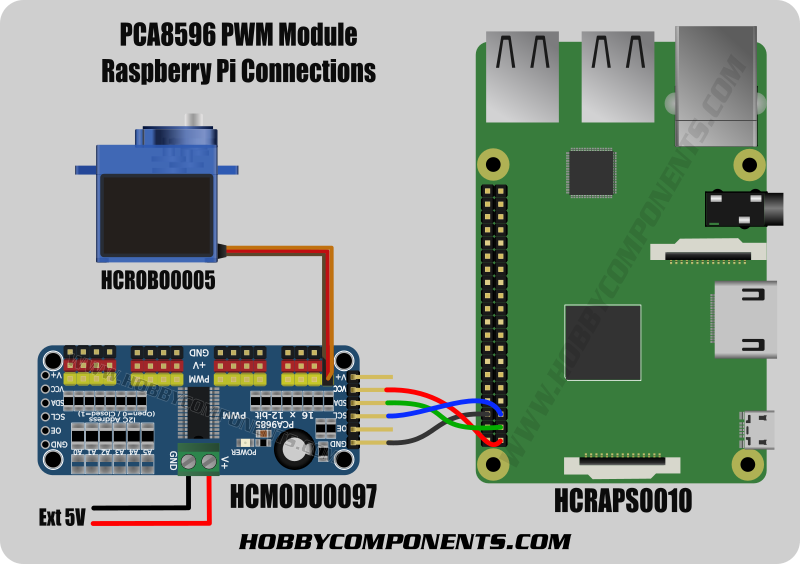 Simply connect the module to your Raspberry Pi as shown below and use the Cayenne software platform to get remote analogue voltage readings without writing a single line of code. Disclaimer: The Cayenne platform is an external free service and is not provided by, or connected to, Hobby Components Ltd. It is therefore not being sold as part of product advertised on this page. As such we do not provide any guarantees or warranties with regards to this service. Issues or questions related to the Cayenne platform should be directed to Cayenne and not Hobby Components Ltd. Libraries, example code, and diagrams are provided as an additional free courtesy by Hobby Components and are not sold as part of this product. We do no provide any guarantees or warranties as to their accuracy or fitness for purpose.